I make a lot of food that I love, but I try not to make repeat dishes. This dish is an exception. 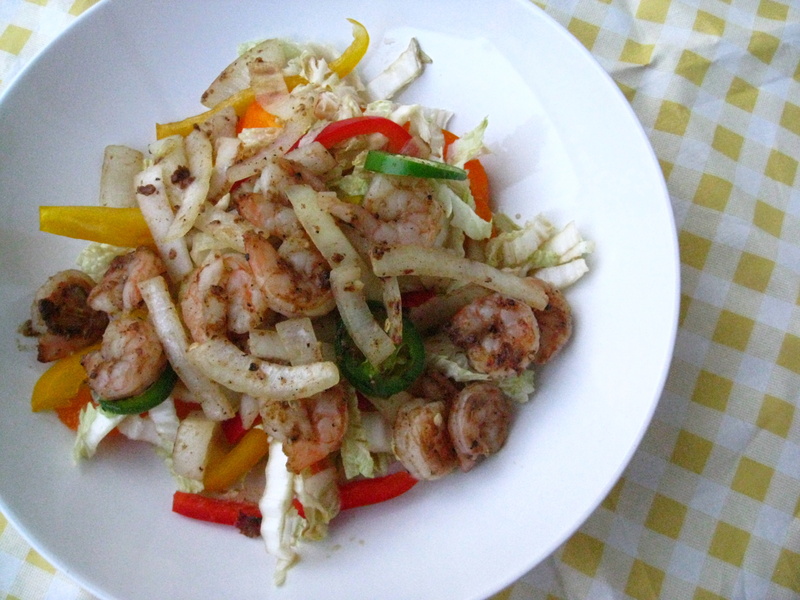 I keep shrimp in my freezer for one reason – salt and pepper shrimp that I can whip up in n a half hour. It’s delicious with the cabbage or served with plain steamed rice. I choose the rice-only route when I’m running short on time. I just add some extra bell peppers into the shrimp itself to boost up the veggie count in the dish. Whisk lime juice, soy sauce, sesame oil, and sugar in a large bowl until sugar is dissolved. Add cabbage and bell peppers and toss to combine. Refrigerate until ready to serve. Combine cornstarch, salt, pepper, white pepper, and five spice powder in a medium bowl. Add shrimp and toss to coat. Heat oil in a large nonstick skillet over medium-high heat. Add onion and cook 3 minutes. Add the shrimp and cook, stirring often, until pink and curled, 3 – 4 minutes. Add jalapenos and cook until shrimp are cooked through, about 1 more minute. Serve immediately with the slaw and rice if desired. Categories: Dairy Free, Gluten Free, Main Entrees, Meat, Quick & Easy, Seafood, Special Diets | Tags: Asian, main dish, quick and easy, shrimp | Permalink.